Wind technology continues to evolve as turbine capacity increases. However, there is one dedicated main component that is already coming up for its 15th anniversary. Eize de Vries examines the doubly-fed induction generator (DFIG), its history, and wind industry views on future prospects and main challenges. By the mid 1990’s power engineers widely considered the doubly fed induction electric machine as an obsolete technology with no real advantages and little future prospects. 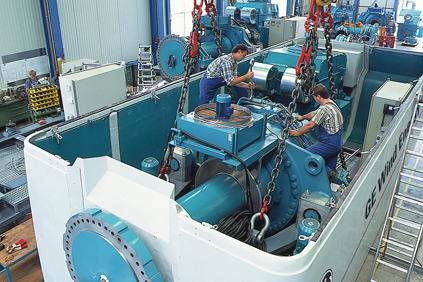 By the late-90s, the technology, in the form of a DFIG with a power electronic converter for variable speed operation, had become a wind industry success story. This was kick-started by pioneering former German firm Tacke Windtechnik (now GE), which introduced a 1.5MW pitch controlled variable-speed geared prototype fitted with DFIG in April 1996. A few months later, it was followed by a 500kW DeWind (now Daewoo) prototype. In the next years several small suppliers introduced DFIG technology, including former US-based Zond (now GE) and Germany’s former Jacobs Energie (now Repower). In 2000 wind market leader Vestas switched from its semi-constant speed OptiSlip technology to variable speed DFIG, while Nordex introduced it in a new 2.5MW turbine. NEG Micon (now Vestas), one of the last remaining large fixed-speed stall-type adapts, switched to DFIG in 2001. Henk Polinder, associate professor electrical machines and drives at the Delft University of Technology in the Netherlands, says DFIG machines were typically applied in industrial drive systems. He says: "Prior to the emergence of power electronics, the rotor part of these machines was often fitted with extra resistor capacity to increase the starting torque and reduce the starting current. Variable speed operation could be achieved with the aid of variable resistors, but this proved a rather inefficient solution." The unexpected new lease of life for this almost written off electric machine came when engineers fitted power electronics to the wound rotor. "The solution enables variable speed operation in a speed range from roughly 60 – 110% of the rated speed," says Polinder. "But the single key cost and efficiency benefits are that only a partial converter in size about 30% of rated power is required as the generator stator is directly grid connected." By comparison, both variable-speed synchronous and asynchronous induction generators require a much larger and therefore more expensive full or 100% power convertor. In 1995/6, German wind experts claimed a cost advantage in the range of €75,000 in favour of the DFIG solution compared to a full converter solution, both at the 1.5MW level. Although the price of power electronics has since come down by at least a factor 8 - 10, DFIG proponents claim it is still a superior solution from an investment angle. Initially, DFIGs suffered from a relatively short 3-to-4 month lifespan of the generator field brushes that feed power to the generator rotor. However, according to wind industry sources, brush life has been gradually improved to around six months and longer, turning brush exchange into a regular service measure. Another well-documented teething problem was bearing damage caused by stray currents, which according to experts has been remedied by insulating the bearings by applying coatings, ceramic balls, with shields or otherwise. In the past, a number of the larger suppliers, including GE and Vestas in some of their geared wind turbine models, have (partially) switched away from DFIG to permanent magnet type generators or PMG’s. GE first introduced a PMG in a 2.5MW 2.5-100 turbine model and, in a more recent example, Vestas in its 3MW V112-3.0MW. 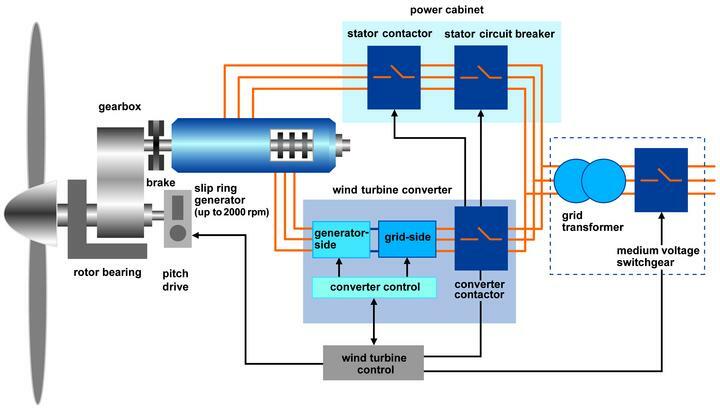 Well-known PMG benefits include superior partial-loads efficiency, a more compact generator design, and the possibility to apply the turbines in 50Hz as well as 60Hz wind markets without requiring hardware changes. Another additional benefit is easier compliance with the latest turbine grid rules requirements. A standard DFIG with partial converter cannot meet these grid failure ride through requirements. However, this is possible with additional hardware and software. One issue source of wind industry debate is the total efficiency of different generator-converter combinations measured over their entire operational range. How does the slightly more efficient PMG measure against the DFIG when set against higher losses for a full converter as opposed to a partial converter? Several sources speak of comparable total efficiency figures for both solutions while others claim a DFIG with a partial converter produces slightly better results. A general wind industry opinion seems to favour a growing role of PMGs in geared wind turbines to the expense of DFIG’s. However, one potential impact upon future technology development is future availability of rare earth elements or REE’s required for PMG’s field magnets. This could potentially favour the continued use of the DFIG, including for REE independence related strategic reasons. Today, an estimated 30,000 or more wind turbines with a variety of power ratings have now been fitted with a DFIG, with REpower’s 6.15MW 6M offshore turbine the largest.